SOME SPOILERS AHEAD – DO NOT CONTINUE UNLESS YOU HAVE READ THE ISSUE! This issue picks up with Tim in the Batcave, having an imaginary converstaion with Damian as he works out his feelings. Alfred interrupts to console Tim, and encourages him to share more of his burden (and his secrets) with the rest of the Teen Titans. That doesn’t appear to be advice Tim is ready to take at this point…and as we learned last issue, he is building up even more secrets due to his clandestine hook-ups with both Cassie and Kiran. Back at the Titans’ amazing yacht, Superboy has returned after the “H’el On Earth” storyline has passed, meeting up with a very hyper Bart and the rest of the crew. There’s not much time to talk, as Tim has a mission lined up to rescue a teenaged meta from Belle Reve, taking the team into the heart of Amanda Waller’s citadel and into battle with the Suicide Squad! All is not as it appears to be, as Tim has a completely different reason for their entry to Belle Reve – and a conversation with Amanda Waller that isn’t fully revealed here. As they return from Belle Reve we lead up to the cliffhanger that sets up a very familiar foe’s appearance in Times Square – but that is for another time and another issue. 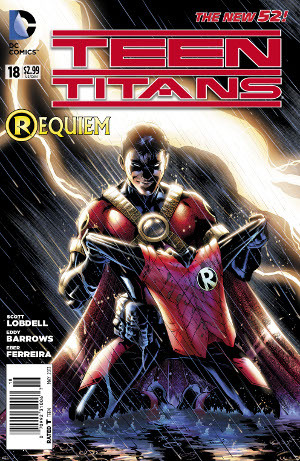 Scott Lobdell scripted the issue. The artwork was divided up, with pages 1-16 by Eddy Barrows and Eber Ferreira on pencils and inks, while the last four pages were drawn and inked by Rodney Buchemi. Alex Sinclair took on colors for the entire issue. There are fewer differences than one might expect between the two sections of the issue, though there are differences in the use of white space and some slight differences in facial expressions. That being said, the artwork overall was good and the change on page 17-20 didn’t detract from the issue at all. As for the story – I had to go back for a second read to give a better comment here. There are a lot of story threads that are either started or briefly mentioned in this issue – and each of them has the potential to be powerful in issues to come. We have the potential relationship issues due to Tim’s hook-ups with Cassie and Kiran last issue, the secrets about himself that Tim still won’t share with the team, the additional secret about the true nature of their trip to Belle Reve, the mysterious folks trying to track down Kiran, and the cliffhanger at the end. Now, I love complex stories with multiple storylines…but this issue was so packed with multiple threads that it kept us from learning a lot about any of them. We did get a great battle with the Suicide Squad, and earlier a very touching moment bewteen Tim and Alfred…but in the end I think the real value of this issue will be as a reference later on when some of these multiple threads start to play out. We will be able to come back to this issue and say, ‘so THAT’S what they meant when…”. I’m holding out hope for more info next issue that will bring more of these threads into focus. SUMMARY: Teen Titans #18 has a lot going on…in fact enough happening that it won’t all make sense just yet. Still, if you are a fan of the Titans, it would be a good idea to have this issue for later reference, as the action looks like it will only get wilder and crazier from here!